Apr. 4	A Homegrown Anthology: HUMOROUS AND NOVELTY SONGS. A few days after April Fool's Day, Homegrown Music presents a collection of funny, quirky, and good-naturedly weird music taken from the archive. Apr. 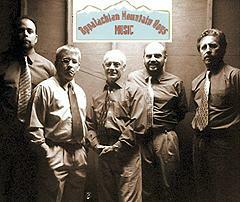 10	A Homegrown Music Live Concert with LOUIE SETZER AND THE APPALACHIAN MOUNTAIN BOYS and BRAZZ TREE. WVIA's unique series of monthly live concert broadcasts continues with some traditional bluegrass, and a very distinctive duo featuring violin and guitar. Louie Setzer is veteran bluegrass artist who, over a long career, has been winning audiences with his classic style, including both bluegrass standards and original music. His group includes both hot young members and long-time seasoned "pickers." They make their Homegrown Music debut in what promises to be a great performance of traditional bluegrass. 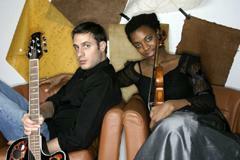 Brazz Tree is the duo of violinist Mazz Swift and guitarist Brad Hammonds. Ms. Swift is a Julliard-trained violinist who also worked as a New York subway performer, where she attracted considerable attention. Her influences run from heavy-metal through Celtic. 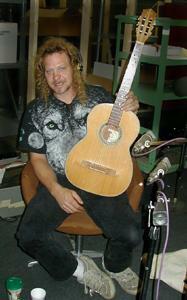 Brad Hammonds performs in a distinctive percussive acoustic guitar style influenced by people like Michael Hedges. He also counts Ani DiFanco as an inspiration. Together they create fascinating, remarkably wide-ranging music original music, and some occasional remarkable reworkings of older songs. As usual, WVIA's listeners are invited to attend the two-hour concert at the station's Public Broadcasting Center studios. Admission is free with advance reservations. Phone 570-655-2808 to request seating. (Note Start time: 8:00 PM). Walter Prezelski in the Studio recording for Homegrown Music. Apr. 18	Walter Prezelski. Singer-songwriter and multi-instrumentalist Walter Prezelski, from Uniondale, PA, returns to the series with a new collection of his always-distinctive songs, marked by often-unconventional lyrics, and his deep bass voice. Apr. 25	Ric Delnero and Chromatica. 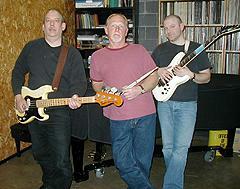 This trio from the Bloomsburg, PA area, describes their music as "electric jazz." They return to Homegrown Music with a new collection of their original instrumental music, featuring creative compositions and fine guitar work.